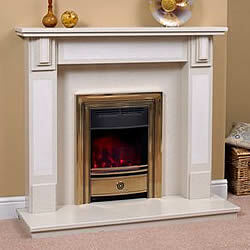 Europa Alberta Fireplace Micro Marble fireplace comes with a Choice of finishes that include Cavern Beige (shown in picture opposite), Dover White and Mexicana marble effect finishes. This Europa surround also Comes with unique and stylish sandblasted header, corbels and uprights creating a contrast of smooth and texture to the finish. 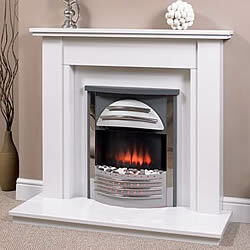 Available with matching back panel and hearth or contrasting Black Granite back panel and hearth. Suitable for use with most gas & electric fires with a standard fire opening of 22.5inchs high by 16.5inchs wide. Available in 1 size only with optional hearth depth of 15inch or 18inch and rebate options of 1 inch or 4inch to choose from that will be suitable for your home. Europa Harrison Fireplace is a Micro Marble fireplace. You can Choose of finishes that includes Cavern Beige, Dover White (shown in picture opposite) and Mexicana marble effect finishes. Optional Floral motif detail available on the uprights. Matching back panel and hearth. this Europa fireplace is Suitable for use with most gas & electric fires with a standard fire opening of 22.5inch high by 16.5inch wide. Available in 1 size only with optional hearth depth of 15inch or 18inch and rebate of 1inch (25mm).